Rarest and Exotic fruits of the world have been so categorized as they generally grown in specific country or region and not known to the common man around the world. A list of such fruits have been presented along with their health benefits. The rambutan is a medium-sized tropical tree in the family Sapindaceae. The fruit produced by the tree is also known as rambutan. According to popular belief and the origin of its name, rambutan is native to Indonesia and Malaysia. The earliest record of rambutan trees show that they were cultivated by the Malayan jungle tribes around their temporary settlements, a practice followed to date. Rambutan trees grow naturally in Thailand, Vietnam, the Philippines, and elsewhere in Southeast Asia, although its precise natural distribution is unknown. It is closely related to several other edible tropical fruits including the lychee, longan, and mamoncillo. It is native to the Indonesian Archipelago, from where it spread westwards to Thailand, Burma, Sri Lanka and India; northwards to Vietnam, and the Philippines. A species regularly sold in Costa Rican markets may be known as “wild” rambutan. Yellow in color, it is smaller than the usual red variety. The flesh exposed when the outer skin is peeled off is sweet and sour, slightly grape-like and gummy to the taste. In Panama and Costa Rican Spanish, it is known as mamon chino (“Chinese Sucker”) due to its Asian origin and the likeness of the edible part with Melicoccus bijugatus. The fruit has been successfully transplanted by grafting in Puerto Rico. Rambutans are a non-climacteric fruit-that is, they ripen only on the tree. The name rambutan is derived from the Malay/Indonesian word rambutan, meaning “hairy” rambut the word for “hair” in both languages, a reference to the numerous hairy protuberances of the fruit, together with the noun-building suffix -an. In Vietnam, it is called chom chom (meaning “messy hair”) due to the spines covering the fruit’s skin. The fruit are usually sold fresh, used in making jams and jellies, or canned. Evergreen rambutan trees with their abundant coloured fruit make beautiful landscape specimens. In India, Rambutan is imported from Thailand as well as grown in Pathanamthitta district of the southern state of Kerala. Rambutans are small red colour fruits with spiky hair on the skin. It has a sweet, juicy flesh which is slightly acidic and small brown coloured seeds whose oil is used in a number of industries. Rambutans are available in two colours, red and yellow. 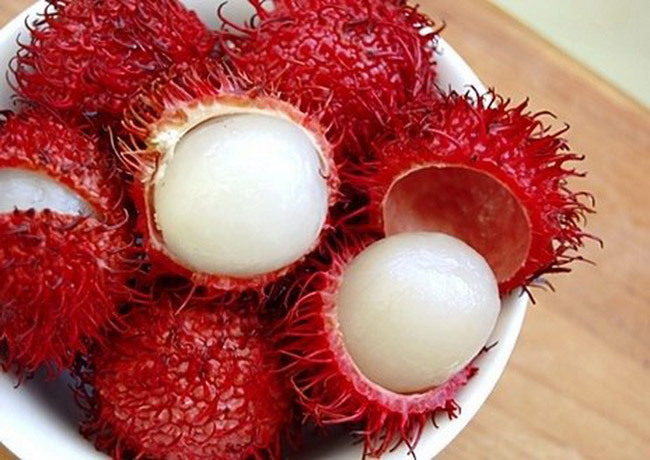 Rambutan is a healthy food and is a great substitute for processed snack foods. Rambutan health benefits are not just limited to the fruit but are derived from other elements as well, like fruit, rind, bark and leaves. This fruit is a traditional medicine in Malaysia and Indonesia that is being used for hundreds of years. 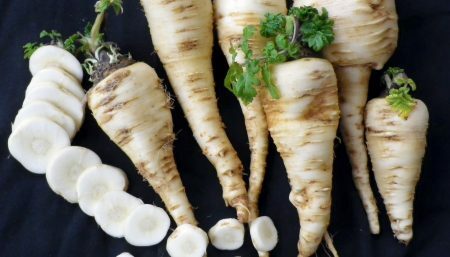 It is used in a number of treatments which includes diabetes, hypertension and various other ailments. The carbohydrates and protein content of rambutan help to increase energy and prevent bloating. Rambutan is also rich in water which helps to get back the lost energy and quenches thirst. Vitamin C in Rambutan helps in the absorption of minerals, iron and copper. It also protects the body from getting damaged from free radicals. One of the main compounds of rambutan is Gallic acid. This compound behaves like a free radical scavenger that protects our body from oxidative damage and is particularly helpful to fight cancer. This fruit contains moderate amounts of copper which is necessary for the creation of white and red blood cells. It also contains manganese which our body needs to produce and activate enzymes. Phosphorus in rambutan helps to remove the waste in kidneys and is essential for the development, repair, and maintenance of tissues and body cells. Rambutan also contains significant amounts of Calcium which works together with phosphorus to fortify the teeth and strengthens bones. Rambutan has good fiber content and is low in calories. The fruit keeps us full for a long time due to its high fiber and water content and controls irregular hunger pangs. This also aids in weight reduction. Rambutan is also good for treating common illnesses like headache, thrush and dysentery. For headache, the leaves are used as a poultice on the temples. This calms the nerves and reduces headache. A decoction of the bark is applied on the tongue to treat thrush. A decoction of roots is used to lower fever. The other health benefits of Rambutan is in its antiseptic qualities. It helps to fight the body infection which invades our body. Besides nutritional benefits, rambutan also offers therapeutic functions. Consuming the fruit can help to kill intestinal parasites and helps to relieve symptoms of diarrhoea and fever. Rambutan plays a significant part in improving the health of your hair. 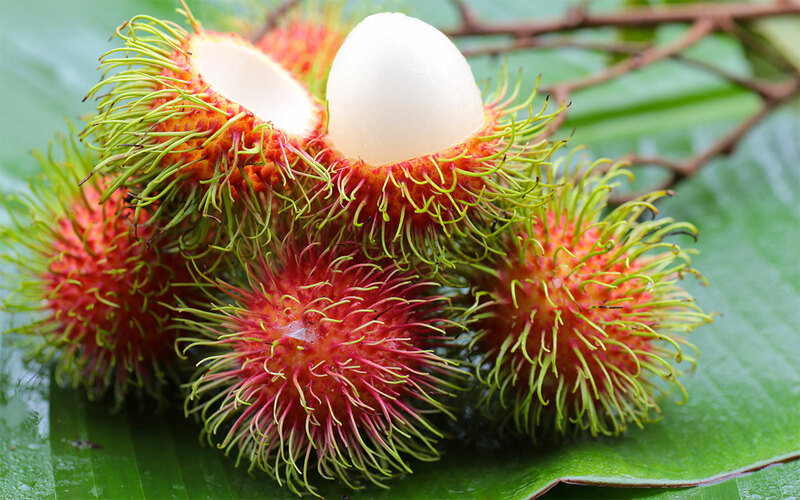 Rambutan leaf paste nourishes your hair from deep inside. Take some Rambutan leaf and mash them until it becomes smooth. Add some water and squeeze the extract. Apply the mixture onto your hair and scalp. Apply regularly for best results.